The work we do continues because of the financial support we receive from the community. Your investment in ConnectiKids will have a lasting impact on more than just one young person, it will have a ripple effect that reaches hundreds of kids and their families each year. Thank you, in advance, for believing in our children and our future! There are several ways you can help us continue furthering our mission. You may choose to make an immediate donation and change the future of a child today, leave a legacy gift through planned giving and change the future of many of Hartford’s children tomorrow. Read about these and many other options below. Below are four different ways that you can sponsor a child. The Tutoring and Mentoring Program connects students individually with a tutor for 75 minutes weekly, granting them access to positive adults in high school, college, government, faith-based and corporate settings. This unique relationship-based approach allows students and mentors to develop bonds, one-on-one, over the course of the school year and exposes children to career choices and neighborhood resources. $20 provides a student with one week of tutoring and mentoring. $80 provides a student with one month of tutoring and mentoring. $640 provides a student with a full year of tutoring and mentoring. The Arts and Enrichment Program allows students to explore their personal strengths, interests and goals through a variety of classes including art, cooking, martial arts, dance and more! These experiences provide life skills that build self esteem, enhance problem solving and communication skills, while contributing to increased school performance. $20 provides a student with one week of arts and enrichment. $80 provides a student with one month of arts and enrichment. $400 provides a student with a full year of arts and enrichment. The Summer Program ties together academic and enrichment activities in an inspiring context for learning, recreation and positive socialization. It exposes children to information, people, places and situations that they are unlikely to experience in their everyday lives. $30 provides a student with one day of summer program. $150 provides a student with one week of summer program. $600 provides a student with a full summer program experience. If you choose this general donation, ConnectiKids will put your donation towards the area that it is most needed for. This may range across any of our programs, supporting tutoring, mentoring, arts and enrichment, summer, or other types of funds. Many employers will match your gift. Please check with your appropriate department and we are happy to complete any necessary forms to be eligble for employee matches. If your company participates in United Way Giving Campaign, you may direct your United Way donation to ConnectiKids. Our United Way number is 5110. A legacy gift to is a planned future donation, given through a will or other form of designation. It is a decision that each person makes in their own financial planning process, taking into account their charitable wishes and values. Consider a legacy gift to ConnectiKids when you are evaluating your personal, family and financial needs as well as your long term charitable giving. There are different options for legacy gifts and a legacy gift may provide significant tax benefits that may actually benefit your family after you are gone. Legacy giving is not just for the wealthy – gifts both large and small are important. Everyone who supports ConnectiKids is at a different stage of his or her life and able to give at a different level. Every legacy gift, regardless of the amount, is important and cherished. Whatever your specific situation may be, any legacy giving option that suits your circumstances will be helpful to ConnectiKids and the children we serve. How do I support ConnectiKids when shopping on AmazonSmile? On your first visit to AmazonSmile smile.amazon.com, you need to select a charitable organization, ConnectiKids Inc., to receive donations from eligible purchases before you begin shopping. We will remember your selection, and then every eligible purchase you make at smile.amazon.com will result in a donation. Providing quality programs for 300 children annually requires a lot of materials and supplies! We welcome donations of supplies for all of our programs, as well as office supplies and gifts for children to be distributed at our annual holiday party. Please deliver your donations to: ConnectiKids at 814 Asylum Avenue, Hartford, CT 06105. Holiday Gifts: ConnectiKids hosts an annual holiday party in December at which all participating students receive a gift, have fun with holiday crafts, and enjoy hot cocoa and a cookie. We welcome donations of new unwrapped gifts. Please contact us for more information. Attend, Sponsor or Donate to an Event! ConnectiKids hosts several fundraising events throughout the year. Check out the donor page for a list of donors of our most recent fundraising event. Check out our calendar for upcoming events and opportunities. 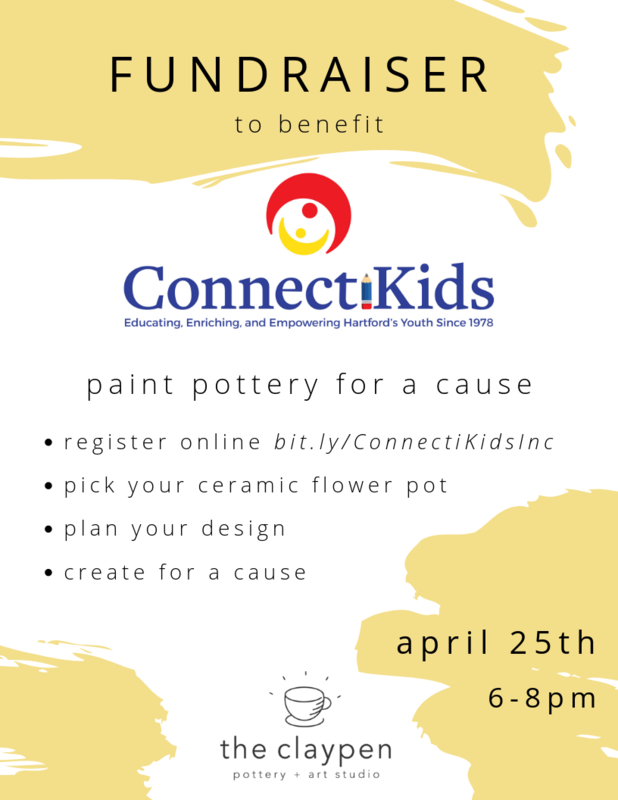 To discuss more ways to support ConnectiKids financially, contact Andrea Williams, Executive Director at 860-522-8710 or via email at awilliams@ct-kids.org.